Marie-Claude Potier is co-leader of the Alzheimer’s and Prion’s Diseases team at the ICM, and Research Director at CNRS. She received a PharmD in 1983 and a PhD in Neuropharmacology from the University Pierre and Marie Curie in 1988. She is member of the American Society for Neuroscience, of the International Society to Advance Alzheimer’s Research and Treatment and on the board of the Société des Neuroscience. She is a referee for numerous international journals and national and international agencies and foundations. In 2005 she received the Dagnan Bouveret Prize from the Institut de France. 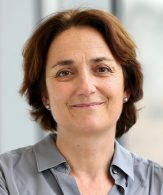 Marie-Claude Potier’s and Stéphane Haïk’s group aims at understanding the role of lipids, particularly cholesterol and ApoE, in the secretion and neuronal transport, of AB, their involvement in endosomal modifications that occur early during the course of the disease and novel mechanisms of AB toxicity identified in vivo. Stephane Haïk’s group studies the development of pre-mortem diagnostic procedures for Prion’s disease, the characterization of classical and emerging human prion strains, the understanding of the molecular and cellular mechanisms underlying prion strain selection, propagation and pathogenicity in the human brain.